When the Environmental Working Group (EWG) makes its annual “Dirty Dozen List” of fruits and vegetables with pesticide residues, it does so without paying any attention to which chemicals were found or what level was detected. This is why it is so misleading. To do the analysis properly does take a lot more “work” – it took me much of the last two days to do it. First I had to download the raw data which comes as a 5.5 MB ZIP File that expands to a 83 MB text file. My son wrote a little Ruby On Rails script that sifts through the millions of rows of data to find the 30,000 actual “detections” of pesticide residues that the USDA reported for 2009. That list has the identity of the pesticide and its concentration in parts per million, billion or sometimes trillion. Next, I searched for anMSDS for each of the 300 or so different chemicals to get the specific acute toxicity (this is usually in section eleven of each document). The acute toxicity is expressed as an LD50 – the milligrams of chemical it would take per kilogram of body weight to kill 1/2 of the rats in a feeding study (Oral LD50). These are publicly available documents which are usually easy to find except for old, discontinued pesticides and some of the metabolites. Dividing the LD50 by the detected amount gives you the multiple of its own body weight that the rat would have to eat to reach a toxic dose. As an example, an old, extremely toxic pesticide, aldicarb (Temik) has an LD50 of 1 mg/kg. This is exactly what you imagine when you hear the word, “pesticide.” In one sample of fresh potatoes, the USDA scientists detected 0.01 mg/kg of aldicarb sulfoxide – a metabolite which is just as toxic as the aldicarb. For the rats to die from eating such potatoes would require that they rapidly consume 90 times their own weight of those particular potatoes. 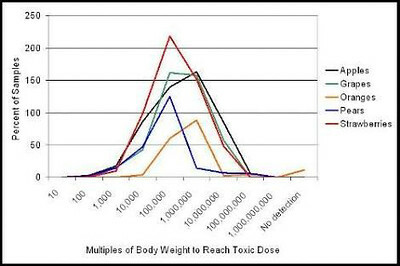 The most toxic potato sample had 1.5mg/kg of the aldicarb sulfoxide which means that the rates could die by eating just one times their own body weight. A rat might be able to do that. The EWG essentially treats every one of the 30,000 detections as equal in risk to these worst-case potato values. Because most pesticides are far, far less toxic than aldicarb, the average residue found by the USDA on potatoes has a safety margin of 595,163. The only reason that aldicarb is still used on potatoes (and it will be phased out soon), is that for purely brand protection reasons, MacDonald’s asked it’s fry suppliers not to give them any more GMO potatoes (they had been using them for several years, and they still cook them in GMO soybean oil and serve up GMO sodas with corn sweetener). Still, McDonalds killed the Bt-potato. That is why potato growers plant their potatoes into a furrow with granular aldicarb so that the roots pick up the insecticide for ~60 days, protecting them from the Colorado Potato Beetle. Still, potatoes are in about the middle of the pack in terms of average safety margin. Oranges have a safety factor of nearly 1.5 million. Sweet corn, which makes the “Clean Fifteen” list for EWG is actually the crop with the lowest average safety margin (8,909). This demonstrates the meaninglessness of the Dirty Dozen list. Of course, averages can be misleading. It is more instructive to look at the full distribution of results. The graph below summarizes all the sample results for fruit crops. For this graph, values on the right side of the graph represent extremely low risk while those to the left represent relatively higher risk. As you can see, even though these crops had many pesticide residues, they almost all were present at vanishingly levels meaning extremely minor risk. People just don’t eat one hundred, one thousand or several million times their body weight of one food in a sitting! When the EWG list is reported by the unsophisticated media, they say things about it which are completely false. For instance thirdage.com said, “The “dirty dozen” list of the twelve fruits and vegetables with the highest amount of pesticide residue was released Monday by the Environmental Working Group (EWG).” That would be impossible because the EWG did not access the raw data which would be necessary to identify how “high” the residues actually were. They say that cherries “dropped off the list” without mentioning that cherries were not even one of the crops tested in 2009. So, what does the USDA data actually tell us? That we should feel confident that the fruits and vegetables available in our markets are perfectly safe, and we should be consuming them in ever greater quantities to take advantage of all the cancer- and other disease-fighting chemicals they naturally contain. It also tells us that the EWG should be ashamed of their list, print a full retraction, and refund their ill-gotten financial gains. If anyone would like a copy of the processed data or graphs I would be happy to email it from savage.sd@gmail.com. Also if anyone would like to improve on my collection of LD50 values that would be much appreciated. My website is Applied Mythology. This entry was posted in Agriculture and tagged Acute Toxicity, EWG, GM-Food, GMO, Organic, Pesticide Residues, Pesticides, Steve_Savage by Steve Darden. Bookmark the permalink. 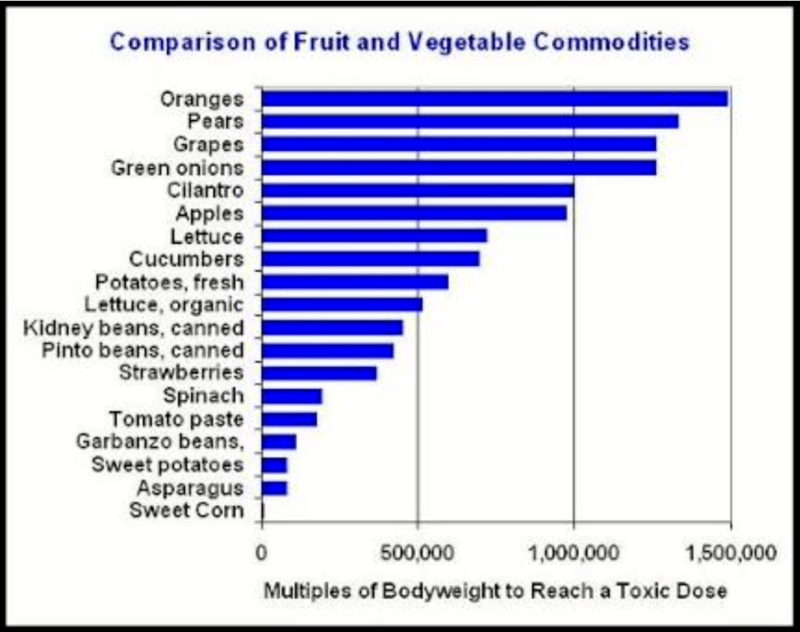 For sweetcorn, which was the worst offender in the above graph, that’d mean you’d need to consume 1.6 million pounds in your lifetime (using my own body weight, so adjsut slightly up or down! ), so if you live to 90 that’s ~17,000 lbs a year or approximately 50lbs a day. You’d also have to accumulate all of the pesticide and save it for the whole period of time. You are probably safe in this respect. Good question. Ewan R’s answer illustrates how large the safety factors are – the ‘tolerances’ set by the EPA. The challenge posed by your lifetime exposure question is “how do we measure that?”. Even if willing to wait a century for the results, the cost of blind, controlled studies would be impossible. Hence the “factor of safety”, or some prefer “factor of ignorance”. Possibly one reason that toxicologists are more relaxed about the cumulative or chronic toxicity issue is that they learn early on that humans have evolved to survive in a toxic world. Our DNA repair mechanisms reflect this constant barrage from background radiation to chemicals. 99.9% of pesticides are natural – the plants have evolved these chemicals because something is always trying to eat them. For a quick read, Steve Savage discusses the toxicology in a very accessible way in What Are Your Favorite Toxins? The toxicological significance of exposures to synthetic chemicals is examined in the context of exposures to naturally occurring chemicals. We calculate that 99.99% (by weight) of the pesticides in the American diet are chemicals that plants produce to defend themselves. Only 52 natural pesticides have been tested in high-dose animal cancer tests, and about half (27) are rodent carcinogens; these 27 are shown to be present in many common foods. We conclude that natural and synthetic chemicals are equally likely to be positive in animal cancer tests. We also conclude that at the low doses of most human exposures the comparative hazards of synthetic pesticide residues are insignificant. This lengthy paper is an edited version of a chapter titled ‘Cancer Prevention and the Environmental Chemical Distraction‘, in the 2003 book Politicizing Science: the Alchemy of Policymaking. You can pay Amazon $9.99 for the Kindle or you can download the chapter “Cancer Prevention and the Environmental Chemical Distraction” [PDF] on the UC Berkeley site. Distraction is the right word. James McCartney asks: might LD50 not be a good value for determining what levels might cause any type of short term impairment or long term damage? Good question. My understanding is that LD50 is the toxicology standard meter. Particular dose-response relationships are referenced back to the LD50. E.g., infant vs. adult. Short vs. long-term exposure. Since we can’t ethically do experiments on humans the baseline data is animal experiments. So there’s uncertainty about human response. The ‘safety factor’ or factor-of-ignorance is developed to conservatively surround the various uncertainties. For a better informed reply email Steve => savage.sd@gmail.com. so, I see that I was essentially asking the same question as the one on chronic toxicity. 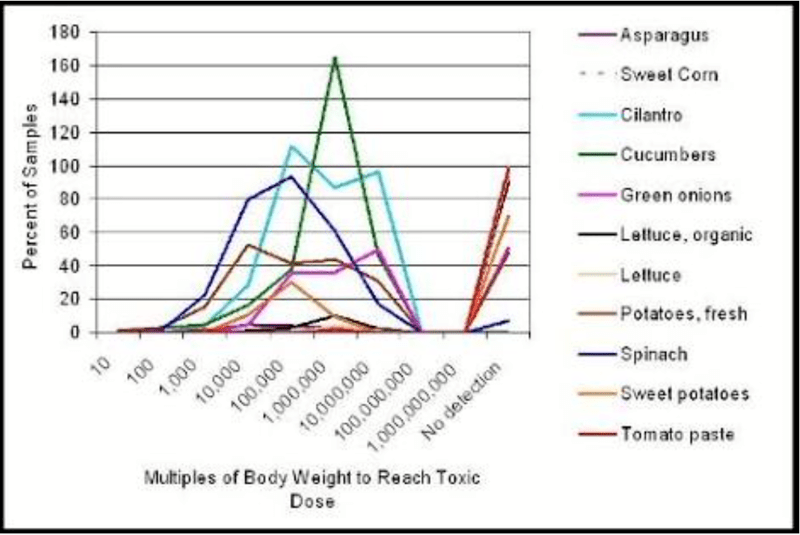 Pesticide residues: what about chronic toxicity and accumulation? Do you have any advice on whether I should terminate this Facebook clone of the real Seekerblog? I find Facebook very time-inefficient and can’t manage the dual-database problem of disconnected comment threads. So I’m inclined to kill the “evil clone”. I can’t tell if anybody else has every looked at the Facebook clone.